B.C. Senior Safety Services Ltd. provides seniors and people with limited mobility, knowledge, affordable choices, and excellent value in the purchase and installation of high quality safe mobility products. Our prices are given freely over the phone and we offer free in home estimates on installations. Accessible showers are easier to get in and out of than conventional showers or bathtubs. People with mobility challenges can walk in directly or transfer into or alternatively a wheelchair user can roll into a handicapped accessible shower stall if built barrier free. They have an open entry so not to hinder a caregiver’s access to lend assistance in case of an emergency. BC Senior Safety Services Ltd. can provide reliable products to insure your safety and independence. Your safety is our primary concern. Our materials and workmanship are top of the line, and we can offer a speedy installation. Walk in tubs can greatly improve independence by enabling individuals who would otherwise be unable to safely bathe in a conventional tub. 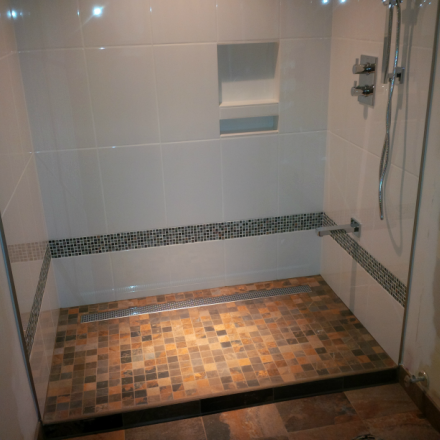 Our custom tiled showers are built well to your standards, and offer a variety of safety features such as benches, folding shower seats, space saving wall niches, and reinforced grab bars. A plastic shower does not compare to the beauty and longevity of a custom tiled shower that adds value to your home. Browse through our before and after images of our walk in tubs and custom tiled shower projects. Serving British Columbia: Vancouver, West Vancouver, North Vancouver, Burnaby, Coquitlam, Port Coquitlam, Port Moody, Maple Ridge, Mission, Harrison, Richmond, New Westminster, Delta, Surrey, Whiterock, Langley, Aldergrove, Abbostford, Chilliwack. By combining both the Air – Jet Massage and Hydrotherapy Massage you get the ultimate bathing experience. The relaxing and rejuvenating benefits of both are unsurpassed. The in line water heater allows bathing for as long as you like while relieving your aches, pains, and tired limbs. Click on the BBB logo to read our 5 star verified customer reviews. Will 3/4″ bath fill taps fill up a bath any faster? Absolutely, as long as the water lines in your home are 3/4,” which is likely not the case. Amost all homes will have 1/2″ water lines in residential construction. You may find 3/4 ” water lines in multi housing like apartment buildings but it is reduced to 1/2″ and 3/8″ before the faucets. Claims made by walk in tub companies that their tubs will fill faster are false. 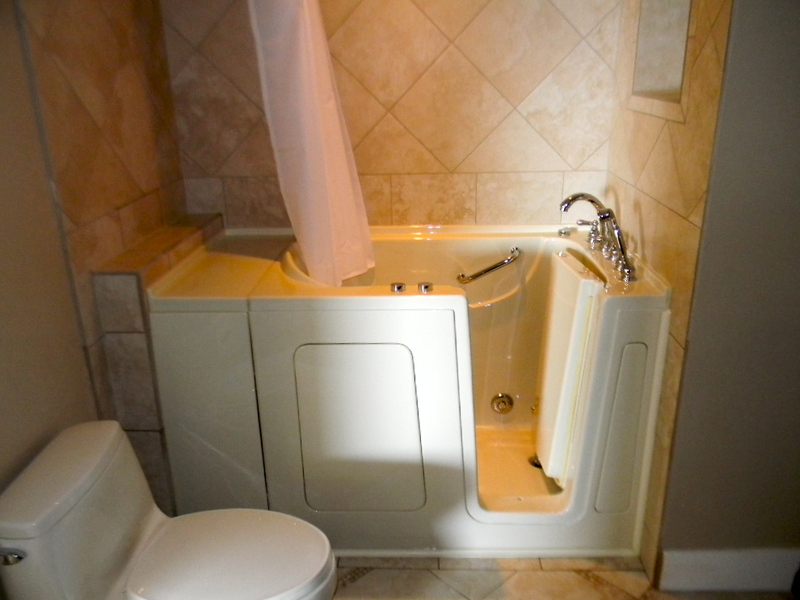 Walk-in tubs with similar dimensions will take the same amount of time to fill. What determines the fill time more than taps, is a home’s water pressure and bather size. It is important when buying a walk-in tub to get the right size for your body. A very small person in a bath too big, will wait longer for the tub to fill, compared to a much larger person using the same size tub. This is due to the amount of water a bather’s body displaces. Depending on the tub and bather size and a homes water pressure, fill time will vary. For a close approximation to know how long it will take to fill a tub. Take a pail, place it under your tub’s spout and record the time it takes to fill. Multiply the gallons of water you expect to use by the time it took to fill up the pail. For an approximation of the amount of water your body will displace and the amount of water you will need, use one gallon of water for every ten pounds of body weight. For instance if the tub you are considering has the capacity to hold 60 gallons of water and you weigh 150 pounds, then your body will displace approximately 15 gallons of water and you’ll need about 45 gallons to fill the tub to its limit. This type of divert-er, is located between taps on a two-tap faucet and can bring water to both the shower and tub. The hot and cold water taps are turned on to mix the water to the correct temperature. Usually, turning the divert-er clockwise 180 degrees allows the properly mixed water to flow out through the shower head. Turning the divert-er counter-clockwise will return the water flow to the tub. As in a 3-valve divert-er, a bather runs water through the tub spout until it is blended to the desired temperature. The divert-er, with 2 valves each in the shape of an L, pushes the water upward to a shower arm and out the shower head. This 2-valve divert-er can be located in the center of a faucet that adjusts temperature with a single dial turned to the left for hot water and to the right for cold, or it can be set between the taps of a two-tap faucet. The tee divert-er is a single-valve located behind the faucet spout. The bather runs the water to the temperature he or she prefers, and then pulls up the pull arm behind the spout. The water then comes out the shower head. A 5pc three-valve divert-er faucet set, and the 4pc tee divert-er faucet set are ones most found on walk-in tubs. The 5pc three-valve is more user friendly of the two. The advantage of a 5pc three-valve is ease of use, particularly when the bather is older and has weaker finger strength. It has its own separate faucet to divert the water from the spout to the shower wand and is very user friendly, requiring no effort at all to use. A tee divert-er, found on a 4pc faucet set can be very difficult to use, especially for older woman who have developed arthritis in the hands and fingers. When the valveis under water pressure, the pulling up action on a Tee Divert-er can be so difficult, ladies can resort to using some kind of utensil, like a wooden spoon, to try and pry the valve up so they can use the shower wand. Men, who are more likely to haves stronger hands and fingers, fair better. Surprisingly, some very well recognized walk-in tub companies continue using Tee Diverter type faucets, despite customer complaints! Walk-in tubs come as soaker models, air jet therapy models, or hydrotherapy jet (water jets.) models they also come with a combination of air and water jets. Soakers are just like a regular tub that doesn’t have jets, you simply fill the tub to the desired depth and bathe. 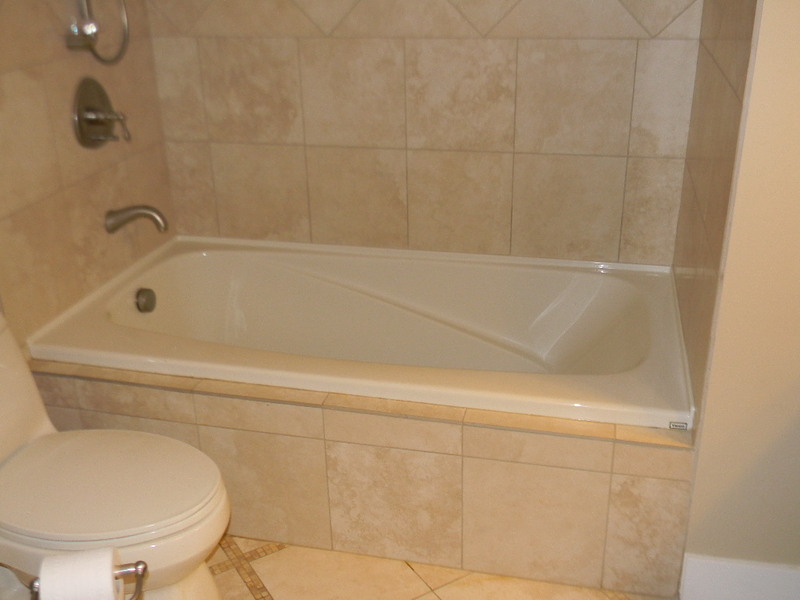 Walk-in tubs with air jets are tubs equipped with a small electric motor that blows air drawing only about 3.6 amp. This blower delivers air through small air hoses to as many as 16 small jets placed throughout the tub. When the air passes through the jet it is broken up into smaller air streams creating smaller bubbles. This is called Air Jet Therapy or Hyrovescent Therapy. The air is released into the tub and agitates the water assisting in cleaning. It’s like being in a washing machine for the body and can lend a helping hand to a person who is mobility challenged and perhaps has difficulty reaching hard to get body parts. This blower motor is not a heater and contrary to what some companies will lead you to believe, it will not maintain water temperature but have the opposite effect. That being said, the benefits of air jets make them worth having. Air jets are also offered in combination with Hydrotherapy jets and in-line heaters. Water jets or Hydrotherapy Jets, as they are referred to, take bathing to the next level! Powered by a whisper quiet electric water pump drawing about 8 to 9 amp, the bath water is drawn from the bottom of the tub, circulated through the water pump, then through a separate stainless steel in-Line Heater which draws about 13.5 amp maintaining bath water temperature. Some manufacturers try to make use of the little heat generated by the water pump for this purpose, but it’s not effective in maintaining bath water temperature. A separate stainless steel in-line heater is the only way to maintain bath water temperature for as long as required! Heated water is directed out massage jets located in areas of the tub where they offer the most benefit, focusing on the lower back, legs and feet. Each jet’s water flow is adjustable from 0 – 100% flow and can be directed to pinpoint just the right spot. These jets also have an aerator (mixing air with the water) which gives a soothing relaxing sensation and helps increase circulation. The health benefits of hydrotherapy are undisputed and is used regularly by physiotherapists. When a individual becomes less mobile, circulation becomes an issue. Being able to relax, stretch, and have your muscles massaged in a warm heated bath offers many health benefits...read more. Air jet therapy, sometimes referred to as hydrovescent therapy, was the first jet option offered on walk-in tubs, but today almost all manufactures have reinvested and retooled so they can they meet the growing demand for the optional hydrotherapy whirlpool water massage jets. Whirlpool baths have a long history having been on the market since the late 1950′s. They continue to be very popular and sold worldwide by leading bath and sanitary manufacturers, with excellent credentials. By following a simple maintenance schedule, hydrotherapy water jets are very easy to clean.…read more. If a walk-in tub has electrical components, you will require GFI’s (ground fault interrupters) to be installed. If the tub only has a small blower motor used for air jet therapy (referred to as hydrovescent therapy) it can be plugged into a GFI receptacle, and because the blower motor doesn’t draw much power, this circuit can usually be borrowed from an existing circuit in the bathroom. If the tub has a water pump or in addition has a separate in-line heater, then one or two 15 amp GFI’s will need to be installed into your electrical panel. You’re not saving labor costs to install one GFI as opposed to installing two GFI’s because the time it takes to fish one or two lengths of wire to the electrical panel is the same. The additional costs would only be the second GFI and the wire. Most existing electrical panels will have room for a couple more breakers, but if they are all used up then a small sub panel will need to be installed for them. Always consult and employ a licensed electrician when installing a jetted walk-in bathtub. 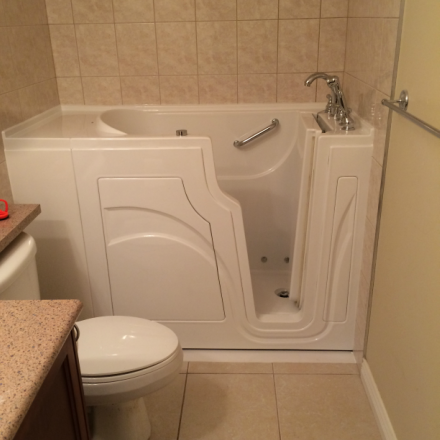 Walk in Tub or Accessible Shower? 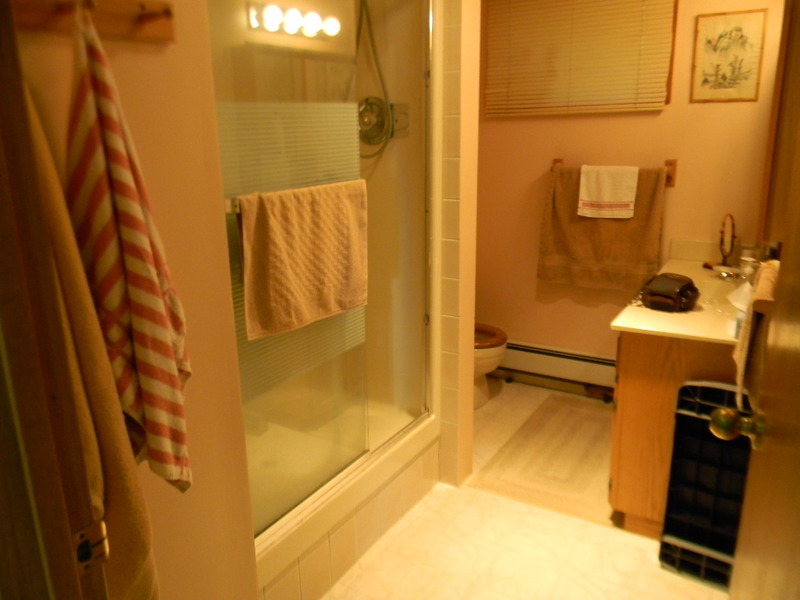 Will the installation of a walk-in tub effect the re-sale of you’re home? BC Senior Safety Services Ltd.